As we take this scheduled time to remember the veterans who fought, and died in wars in the name of our Country and others, I ask you to consider those who are still with us, and who deserve our time, our respect and our service…..not just today, but always. Maybe some of you are too young to have known your grand and great-grandparents, aunts, uncles and other family members who fought, and may have died overseas. Perhaps your relatives have passed down stories, or shown you faded pictures of their loved ones in uniform, posing with their crews or regiments, forces or mates. Some of you may even have a family member or friend who served recently, who may not have come home….who may still be enlisted and fighting for their lives. I remember the Royal Canadian Air Force uniform hanging stoically in my Papa’s closet. It reflected the man who once wore it, as he was then…..a strong contrast to the old black and white of my Dad hanging in it…..the wire hanger suspending uniform and kid off of the old clothesline in the yard. Medals were piled messily on the dresser…..amongst the change and stamps and matches. The pictures…the visuals of my memories. The memories….insidious visuals in Papa’s mind. Pictures don’t tell the same stories that veterans do aloud..those who choose to speak of them. Many, like my Papa, chose not to, could not, would not speak of them at all. The images reflected the stories in silence….connected groups of strangers, forced into camaraderie and living and dying for each other, their loved ones and their countries. Avro Lancasters were shown centered among the pilots, and airmen, the gunners and bombers….kneeling in front, seated on wings, arms over shoulders with crewmen, allies and friends. What seems to be, and what is conveyed…..strength, honor and victory…..is merely external. What unfolds within is unimaginable, unspeakable…….and simply never goes away. Even in ceasefire, and the declaration of peace……the war rages within….the pain and the anguish……he bombs and the guns and the dying…..
Papa stands in this picture somewhere…..a member of the RCAF 405 Squadron…..WWII. 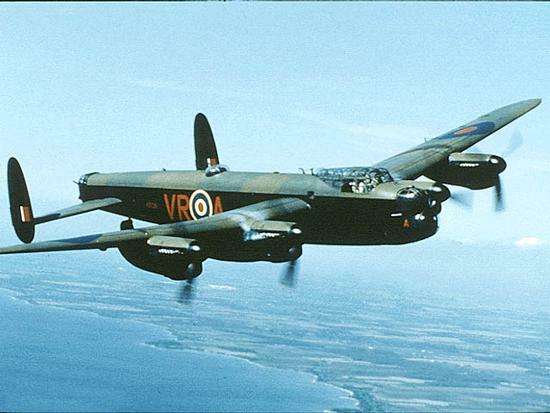 Below, a picture of an Avro Lancaster Bomber…. One picture that stood out and still does, reflected the meticulous line of soldiers standing for Sir Winston Churchill, as he inspected and respected the troops………history captured and kept in the sunroom……in the piles and piles of pictures…..this one here…..Papa is on the extreme right hand side of the picture….Sir Winston Churchill and he practically face to face…. Stories are told through images that make us feel so proud…so strong and so thankful. We have absolutely no idea….. Here is Papa, with Keith Boyer, who was killed overseas…..and Keith’s brothers, John and Bob…. My Grandma and Papa reading the paper together on the couch….I still miss them so much…. Papa’s family was from Glasgow, Scotland. He was the only child to have been born in Galt, Ontario, after John Greig and Elizabeth Brown moved their family from the UK, overseas to Ontario, Canada. Galt, known more commonly as Cambridge now, honors its veterans through write-ups detailing as much history as can be found, and by naming streets and neighbourhoods after it’s honored and fallen community members. You can read the entire publication here…. Maybe your loved ones are listed. Below, I have copied and pasted excerpts from the publication, which are write-ups about Papa and his brothers….his father and his uncles….and their roles in both WWI and II. Below, the first excerpt about my great-uncle Archie. Brown, Dave Galt RCAF WW II Grace Russ Scrapbooks Vol 2 p 8 Son of Mr and Mrs J.G. Brown, 141 Francis Street; one of 5 brothers in the service: George, Stewart, Jim and Archie; RCAF; stationed at Hagersville. Papa….what a story. Although he lived in fairly decent health until the age of 93 in 2005, and we were all pretty close, especially as kids….I never knew of his experiences until I stumbled upon this site, and read this a few months ago. Brown, George Warrant Officer 1941 Galt RCAF WW II Grace Russ Scrapbooks Vol 2 p 8 Photo; Warrant Officer; son of Mr and Mrs J.G. Brown of 141 Francis Street; well-known Galt baseball player; arrived home Sunday after flying to Canada with a Lancaster Squadron; has been overseas for 2 1/2 years and had 34 operational flights with the Pathfinders which led the way to spot targets; during his tour his ship caught fire once over a target; the crew got it back to the U. K. for a crash landing but came out basically unharmed; was hospitalized with an injury from a baseball game and while in the hospital it was struck with a bomb druing an enemy air raid; he suffered further injuries from this and altogether it was five and a half months before he was released; he was able, however, to go back to operations and is again “first rate”; he is one of 5 brothers on active service, including Stewart, RCAF at Trenton, Jim, RCAF at Hagarsville, Archie in Europe with the Canadian Army and Dave who is with the RCAF at Hagarsville; he is now on a 30 day leave at the end of which he will report back to Greenwood, N.S. Vol 4 p 83 Photo; son of Mr and Mrs. J.G. Brown, 114 Francis Street; on active service in the RCAF; enlisted August 1941; born in Galt; 26 years old; played junior, intermediate and senior hockey as well as basketball and softball for Galt; was employed at Ridsdale electric shop before enlisting; his father served with the 34th Bn. HLI of C during WWI as well as 3 uncles, 2 of whom were killed in action and 1 was prisoner of war; Presbyterian. To us kids….he was just a really goofy, sometimes grumpy….extremely sarcastic guy. We heard of how he was quite the ball player back in the day…and recall him singing “Off we go…..into the wild blue yonder….” he’d sing it…then whistle….contemplating things afterwards with a glass of rye…His back hurt and it ticked him off if we didn’t clean the windows “just so”….but he and grandma made it to all of our ball games, came to watch me ride horses regularly, and let us stay over for as long as our parents would let us….it was never long enough. I remember him standing proudly admiring his black standardbred Laddy…..as he held him by his lead shank, letting him graze at the Paris Fairgrounds back when the racetrack and barns were bustling. He smelled of brylcreem and polident. His blue budgie Bob used to sit on the side of his glasses of rye chirping away….Papa chirping back….it was so funny. He taught us how to drive the riding lawn mower and his Chevy Impala, and would shovel the pond every winter for family pond hockey games….he loved Allsorts and so do I. Brown, Jim WW II Grace Russ Scrapbooks vol. 2 pg 8, RCAF, Stationed at Hagersville, one of 5 brothers in the service, George, RCAF, Archie, Canadian Army, Stewart, RCAF, Dave, RCAF, son of Mr. & Mrs. J.G. Brown, 141 Francis Street. Brown, John G Private 1915 Galt 34 th WW I Peace Souvenir p 37 Private; Galt; enlisted 1915; 34th Bn. 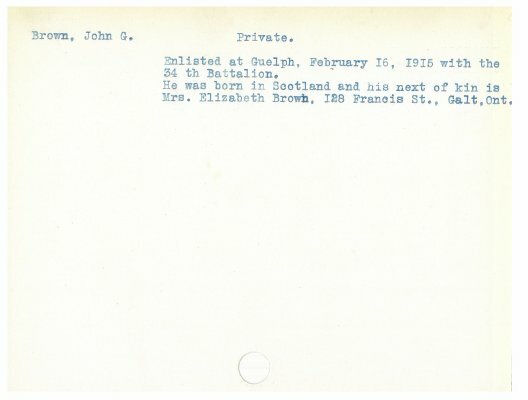 Library and Archives Canada – Attestation Papers Reg # 302017; Gunner; born 24/11/1879; 34th Bn; born in Glasgow, Scotland; husband of Elizabeth Brown, 128 Francis St. Galt; labourer by trade; enlisted February 16, 1915 at Guelph; 36 years old; Methodist. #121, Funeral Friday February 19, 1999 at 2 p.m. at Little’s Funeral Home, internment at Mount View Cemetery. Papa and his brothers have long passed now. I think about the times we had, with them…our lives now….and I can’t help but be utterly amazed that had they not survived, not been able to endure the most unbelievable feat of living through WWI and II, none of us would be here…ever….non-existent. It’s not enough to give thanks and take a moment, one minute of silence, one day of the year. Visit the veterans, whether they be your own family or not. You never know. They may have saved your loved ones on the battlefields and made it possible for your family history to be written. Volunteer opportunities exist at local nursing and retirement homes. Give to yourself, by giving to others. Time costs nothing, but is worth more to those who are alone or suffering, or who simply have stories to tell, than any material thing ever could. Take time to give time….and to listen and learn from those who have lived before you. Support your local legions. Although the number of veterans who are still with us, is dwindling…..we must never forget. We quite simply, would never have existed if it weren’t for them fighting for their lives, and surviving what their governments insisted they do for them. Be mindful of the memories. We can’t possibly imagine what living through war does to a person’s mind, body and soul. Think of the world now….and the millions of people living through it each day…. The state of support from our country and others, for veterans today, is shocking and unacceptable. Wage peaceful and productive battles to bring awareness to this issue, and to push for better benefits and support for the men and women who serve their countries. Write to Veteran’s Affairs Canada to have your voice be heard. Stand and fight, peacefully and productively for those who risked their lives in the name of their countries…the very ones who have swept them aside and continue to do so……. As the sun shines gently on the cenotaph here in Paris, it seems a fitting tribute after the grey skies, to the lives lost, the survivors, and the families and friends who are able to gather to give thanks. Who were given life because they fought and survived. Now we have a chance…..a chance to make changes, and the hope for freedom to simply just be. It takes more than one day to remember sitting on the laps of those we knew, who fought and came back here to give our families life. It’s seeing the signatures of those we never had the chance to meet….who did the same for their own, who are our own. It’s living your life with wonder, and appreciation and dreams of endless possibilities. It happened before, it can happen again. All thanks to them….our veterans. We can move forward in peace, and assuredness that power and greed are not glorious. For our children, and theirs, and our memories.